E-LW: dosage and adjustment of the flow of material exiting from silos, tanks, hoppers. READING OF THE DATA: net weight, instantaneous capacity, instantanous pid value, partial total, general total, status of the optoisolated inputs, status of the optoisolated outputs, flow target (for the controller modes), minimum flow, maximum flow, dosage time, target to be dosed, set point enabling/disabling value, scale status. AVAILABLE COMMANDS: dosage Start/Stop/Reset, programming of flow target, target to be dosed, dosage time, print format, reset of the totals accumulated, programming of setpoint. 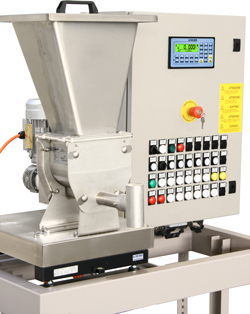 Software version for the measurement/integration of the weight, the flow of material exiting from silos, tanks, or hoppers, with memorisation of the quantity of dosed material; possibility of adjusting the flow through the 16 bit analogue output and the PID control. Possibility of remote management of the instrument through Sysway or Modbus RTU protocols, as well as Profibus through external optional interface. - Instantaneous reading of the flow, in g/h, kg/h or t/h with displaying of the status of the system and of the dosed total. - Adjuster of the dosage hourly flow, with adjustment of the belt speed or of the material flow through the analogue output with completely adjustable PID adjustment algorithm (proportional, integral, derivative). Visualisation of the hourly flow graph and wide range of data displayed on the display. Calibration of the flow reading function, for perfecting the dosage performances. 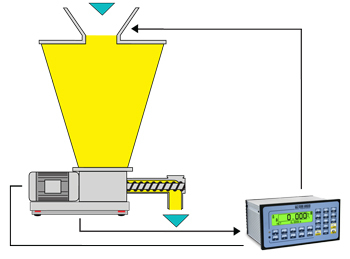 Reading filter of the hourly flow with configurable incidence and speed depending on the system. Programmable dosage target upon weight or upon time, with relative contact. 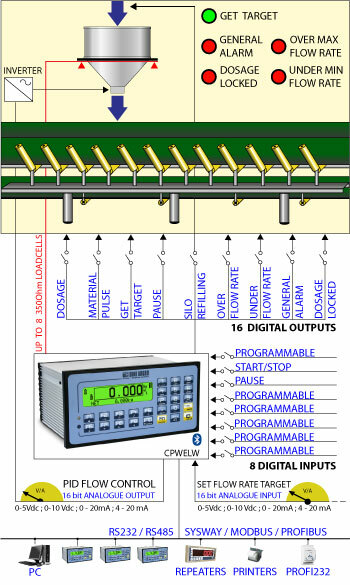 Programmable delay at the start, for synchronisation of various E-LW systems in the dosage of material mixtures. Management of the slow flow with programmable activation threshold, for more precise dosages. Management of the dosage total under way and general total of dosages, printable and clearable independently from each other. Management of the automatic dosage from remote master or through serial protocol. Printing of the dosage data and the total. Completely programmable printouts, for compatibility with any ASCII printer manageable through the serial port. Database of 100 products with: 5 alphanumeric description, hourly flow target, weight dosage target and initial value analogue output. Manual programming of the products or throught PC software (Dinitools). START / RESTART dosage, PAUSE / RESET cycle and emptying of the belt out of the cycle. Quick switch of the hourly flow target and of the dosage target. Quick introduction and selection of the dosage data. Activation cycle, START / RESTART dosage, PAUSE / RESET cycle and unloading of the belt out of the cycle, through external inputs. Impulse counter of the accumulated quantity through relay contact, for direct communication with PLC or external devices. Relay contacts dedicated for the complete management of the alarms and the blocks for off weight, off flow and belt side-slipping. Input and output with programmable functions. 16 bit analogue input (optional) for programming the hourly flow target. 16 bit analogue output (optional) proportional to the hourly flow (lector mode) or programamble for regulating the dosage speed (regulator mode). Serial communication protocol for programming the products and reading the cycle status. SYSWAY and MODBUS communication protocol for programming the dosage data and managing the cycle. External Profibus interface (optional), for programming the dosage data and managing the cycle. Optional Bluetooth connection, for quick wireless programming of the product, through PC or PDA. LW Software for continuous dosage exiting from silos, tanks, hoppers.